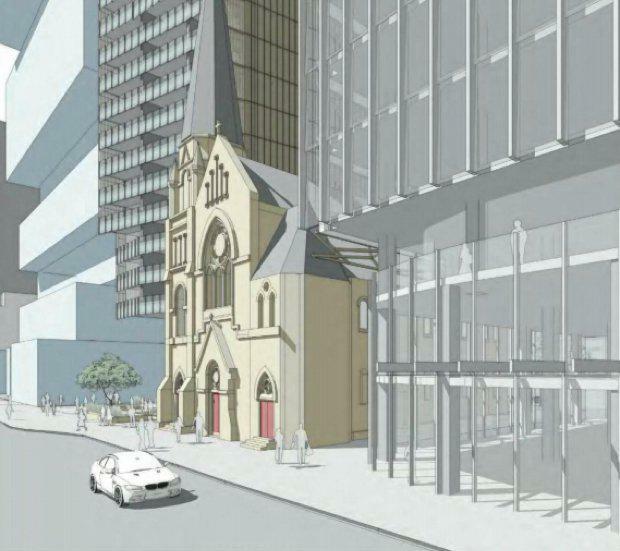 Parramatta Mission and the United Church of Australia, with the help of Turner architects, have submitted a development application to redevelop a historic church in the heart of Parramatta. Located in Parramatta Square at 99-119 Macquarie Street, the aim of the development, estimated to cost $41.58 million, is to retain and restore the heritage-listed Leigh Memorial Church and create two mixed-use residential and commercial buildings on either side. The first building at 99 Macquarie Street, to be dubbed "Epworth House", will be 54 metres and 13 storeys with a gross floor area of 9,034 square metres. It will contain a mix of uses include retail options, commercial offices a group home facility and additional community facilities. There will also be a four-level basement providing the parking capacity for 92 vehicles. 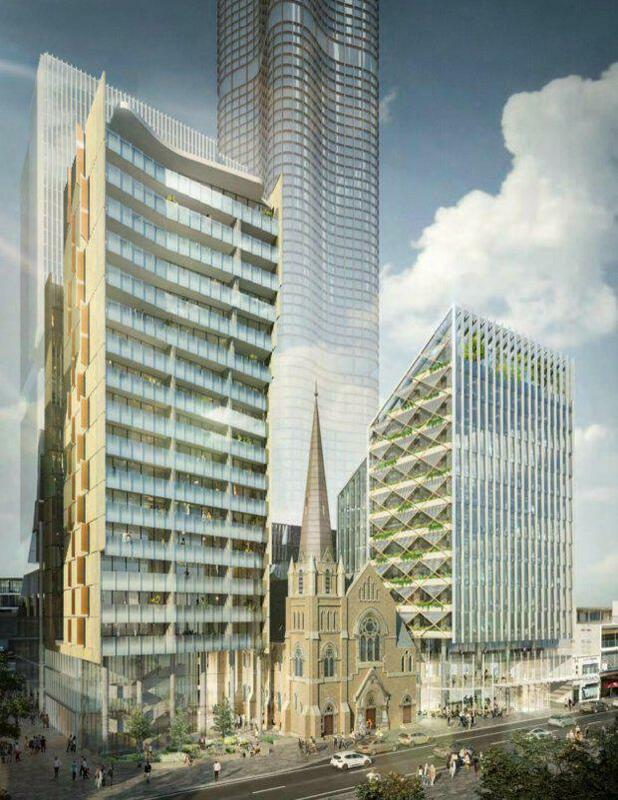 The second building on the other side of the church at 119A Macquarie Street, called "Fellowship House", will take the form of a 19-storey structure up 62 metres tall. Much like its sibling, this building will also provide mixed-use functions including food and drink premises, community facilities, residential apartment in the higher levels and a "public place of worship". The development also includes a reinstatement of the Leigh Memorial Church Spire, the creation of a new building entrance to the church and an adaption of the existing Place of Public Worship with ancillary community facilities and activities. Parramatta Mission have named their project"inSpire the Common Good". According to the Mission's social impact statement for the development Parramatta square has been the gathering place of aboriginal clans for up to 6,000 years. A key concept for inSpire the Common Good is to be a gathering place and space in the heart of the second Sydney CBD. The site of Leigh Memorial Church has been a place of worship since 1821. Since then, the site of worship has taken on several incarnations, including an upgrade in 1839 and then again in 1885 due to the growing population of Methodists in Parramatta since original settlement in 1788. The area around Parramatta Square is of great significance for Aboriginal heritage. According to the planning proposal, there is evidence of aboriginal settlement dating back 30,000 years. Parramatta was established within a year of European arrival, and as a result archeological investigations have revealed large numbers of artefacts. 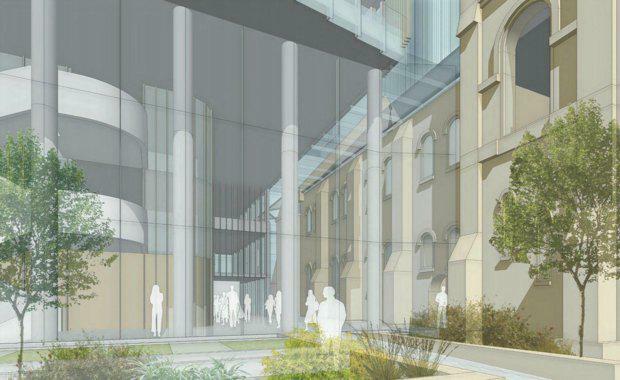 “A large glass void will be included on the fellowship centre site of up to two stories high, through which people will be able to see the church and will be a gathering and a meeting place for people,” Parramatta Mission said. “Below ground level there will be a café, a 50 seat interfaith prayer space, and a 200 seat auditorium available for public activity. Above will include residential places, the sale of which will pay for the project." “On the Epworth site, below ground level will be a social enterprise cafe, and employment training. Meals Plus and WSLARS will continue here. Above will be a variation of a Common Ground accommodation that provides a ‘one stop’ entry point for people facing homeless crisis and or living with a mental illness." “Accommodation will provide for women and men crisis accommodation and affordable/social housing, and what we currently call transitional housing, yet all in the one place, and with whatever wraparound support that people require, so that people will develop not dependency nor independency but interdependence." “This expresses our value of dignity." 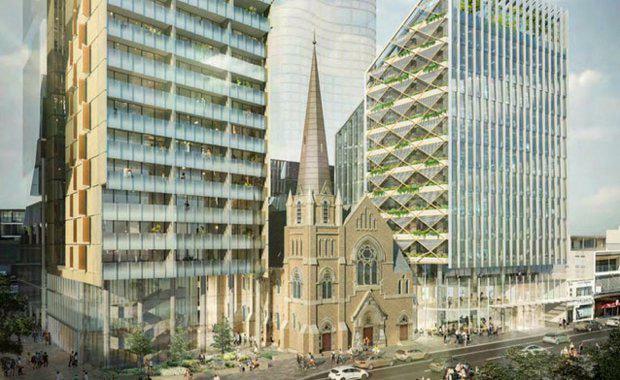 "The approval of the proposed development, for Parramatta Mission, will be the creation of a place that will pursue the common good; a “nurturing place of forgiveness, the healing of life’s wounds, mercy, compassion, reconciliation, love, friendship and grace."